This Friday, the Bay Area is getting its first real dousing of rain this season. While there’s no question the state needs the rain, there’s concern about a community already on edge: Pacifica. In less than 48 hours, Pacifica’s tranquil waves could top 15 feet, as the National Weather Service has issued coastal flood and high surf advisories starting 3 a.m. Friday and lasting until 9 p.m. The agency has advised everyone to stay away from the water, especially near the cliffs. However, the warnings are not so swell for those who live on the cliffs. His former apartment building was evacuated and red-tagged last winter after a drone captured footage of the cliff falling apart. The apartments next door were so close to the edge that the owner chose to tear it down. The move actually created an ocean view for 15-year-old Anthony, who lives across the street. “We can actually get a view of the ocean from our bedroom right there,” he said. However, he says the vistas aren’t worth it, and he and his family are moving to escape the erosion. “Sooner or later it’s going to come back here, so we gotta go,” Anthony said. Short term, however, the City of Pacifica is monitoring the weather. “We are not expecting problems with the sea wall due to this weekend’s storms. 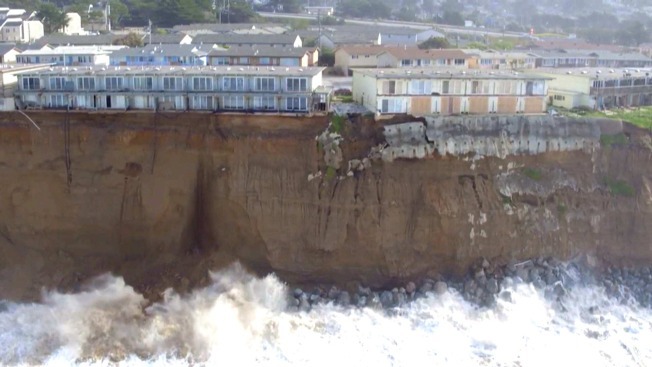 We have staff on call who can respond should there be any problems,” Pacifica City Manager Lorie Tinfow said. Wednesday, contractors completed repairs to one section of the promenade, which was damaged by last year’s El Nino storms. Repairs to that and part of the sea wall are expected to be done in about a month, according to Tinfow.